Australia’s reigning champion sire Snitzel (Redoute’s Choice) also proved popular yesterday, with a colt selling for $450,000 and two others making $300,000. The highest-priced colt was purchased by Darren Weir Racing and John Foote Bloodstock from the draft of Mill Park Stud as Lot 528. The colt is the third foal out of the Group Two-placed mare Miss With Attitude (Galileo), who is a half-sister to the stakes-placed Oui Si Attitude (Bianconi). Miss With Attitude’s only foal to race, Plagiarist (Dalakhani), is a Sydney metropolitan-placed colt trained by Chris Waller. Foote bought the colt for a Hong Kong-based client of Weir’s, with the horse to remain in Australia at least in the short-term before a decision is made on whether to race him in the Asian racing capital. “He will stay here and he then might possibly go to Hong Kong, but the owner races quite a few here as well,” Foote said. “It is hard to buy the nice horses here. People are saying the sale is down, but if you line up to buy the nice horses it is not easy. Mill Park Stud’s Chris Watson was pleased that the colt was going to the leading Victorian stable of Weir. “It is an absolutely fantastic result. We were thrilled for that colt to go to that combination in a great judge in John Foote and trainer in Darren Weir,” Watson told ANZ Bloodstock News. The build up to the Inglis Premier Yearling Sale might be in full swing, but for leading South Australian nursery Mill Park it's just the start of a busy two weeks with the Magic Millions Yearling Sale in Adelaide to follow hot on its heels on March 13 and 14. Fawkner, Southern Speed, Happy Trails, Rebel Raider, Serious Speed, Captain Sonador, Go Indy Go, the list goes on… with the current star performer being exciting three year-old filly Booker. A $230,000 Inglis Premier purchase from the Mill Park draft, Booker was a Group II winner in the spring and ran a game fourth last Saturday in the Group I MRC Oakleigh Plate behind Russian Revolution beaten less than half a length. 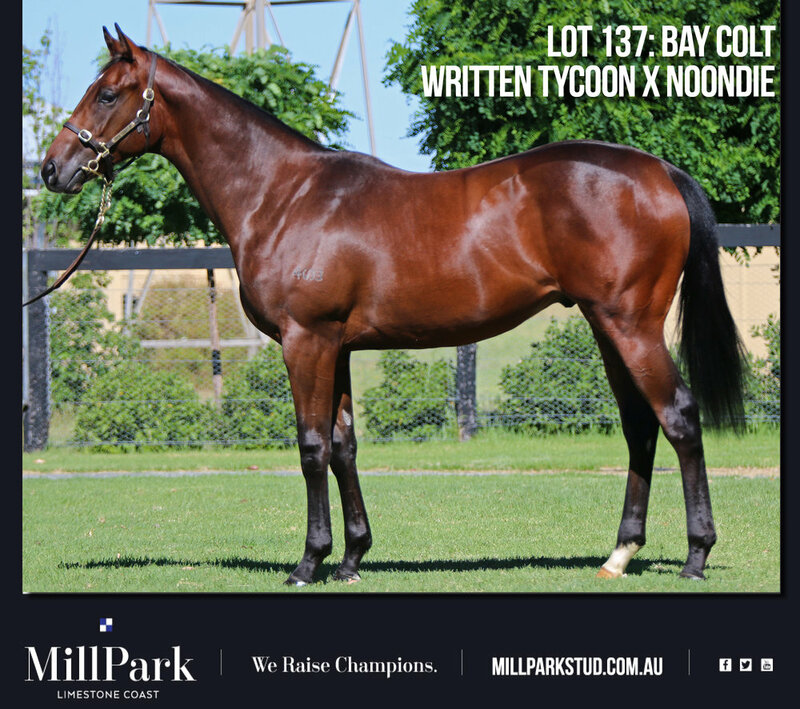 The daughter of Written Tycoon has already won over $400,000 in prizemoney and promises to be the next Group I winner to fly the Mill Park flag. Half-brother to Group III winner Waging War. Second foal of a winning half-sister to Group II winner Catapulted, from the family of Group I winner Ihtsahymn and Group III winner Jukebox. Full brother to a winner and is fourth foal of an unraced half-sister to stakes-winner Court Connection and daughter of stakes-winner Imperatrix from the family of Group I winners Curata Storm and Voile D'Or. From a winning daughter of Group II winner Regal Kiss from the family of Group I Blue Diamond winner Undoubtedly. Half-brother to smart Adelaide winner Galaxy Gazer from the family of this season's stakes-winning juvenile Nomothaj. Full brother to stakes-winner Pretty Punk, who has since won the Group III Hobart Cup since the catalogue went to print. 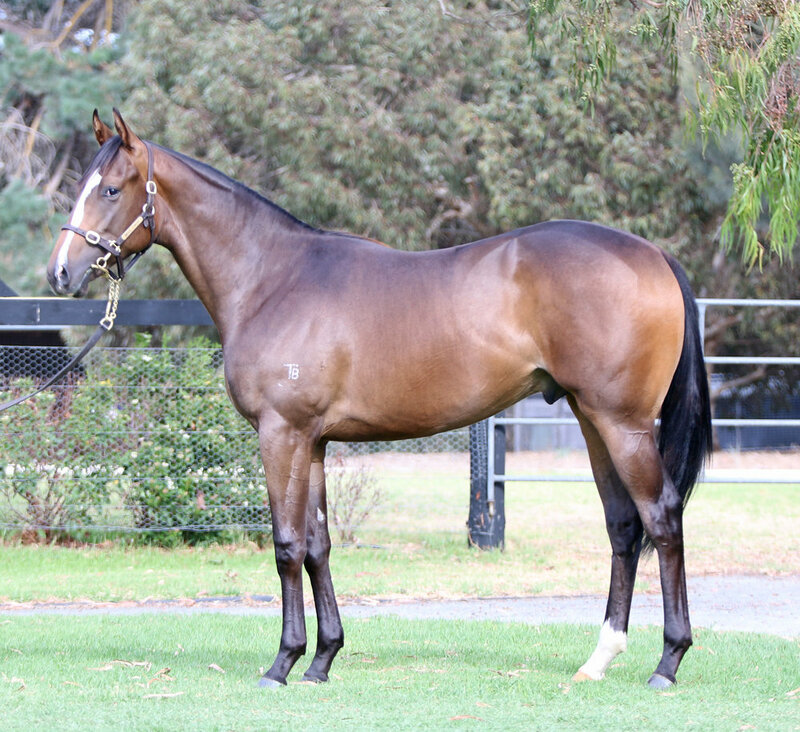 First foal of Oakbank Onkaparinga Cup winner Amalgamate from the family of stakes-winners Mowglii and Kipling. 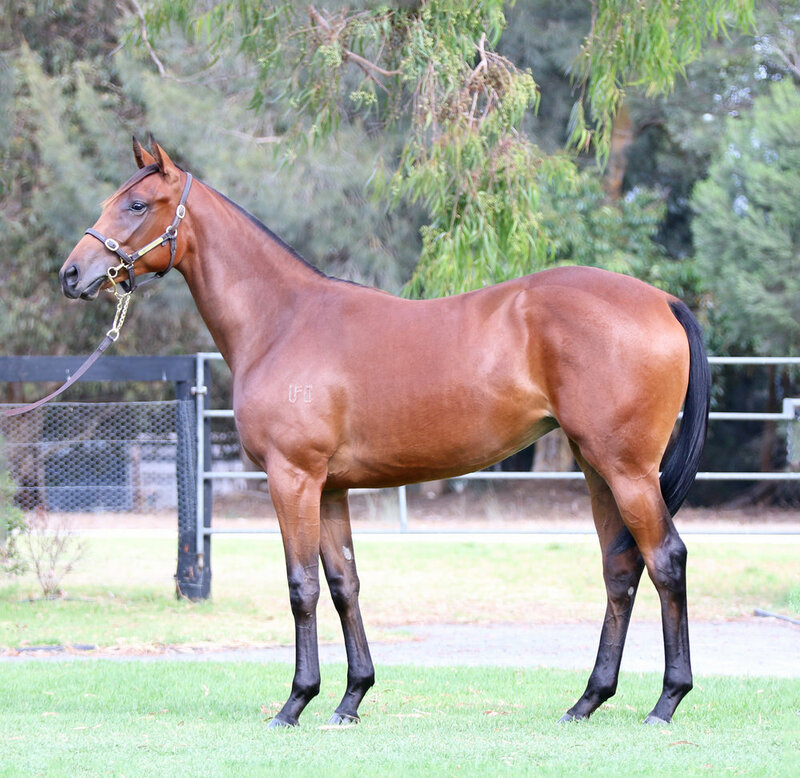 Half-sister to 2010 Macau Horse of the Year Golden Star, from the family of Group III winner Friday Creek. Her trainers Leon Macdonald and Andrew Gluyas won Friday's Bow Mistress Trophy with Gogo Grace, who earned a $90,000 winner's cheque, before Pretty Punk banked $150,000 for her connections with her Hobart Cup victory. Apprentice Ben Allen made the most of a pick-up ride that become available whenCraig Williams was suspended at Sandown last Wednesday. Allen allowed Pretty Punk to roll forward to sit second, handy to a slow speed set by Earl Da Vinci, before midrace moves from other runners gave the mare some cover in the back straight. Allen let Pretty Punk stride forward to join the leaders in the home turn, easing the four year-old to the outside part of the track while she defied the challengers to score by a short neck over the $3.40 favourite Andrea Mantegna. Macdonald said Allen's ride was the difference between winning and losing. "We brought her down here to win obviously, but when you get here races obviously get harder, and it looked a pretty even race between three or four horses I thought," Macdonald said. "I know all jockeys ride well when they win but that was a superb ride by Benny Allen. I couldn't get over the run he gave her. If he had been beaten he had still made all the right moves." 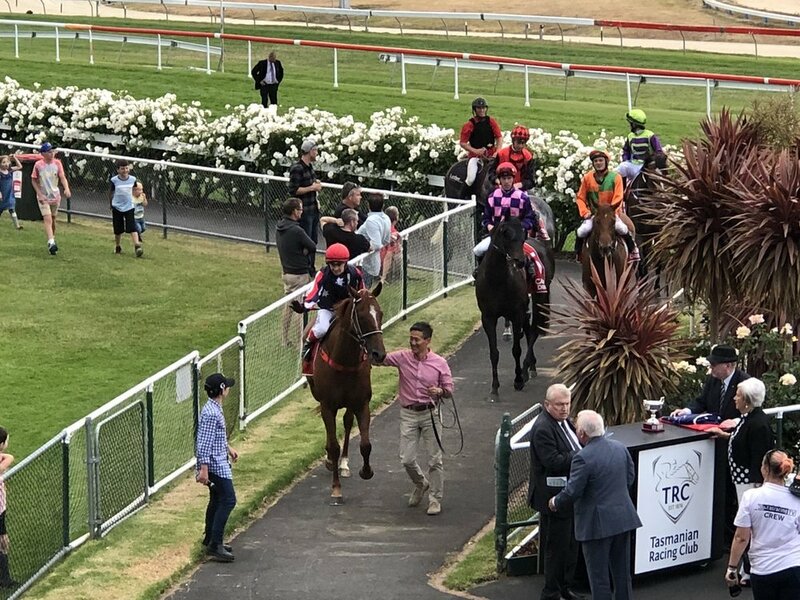 Macdonald said he and Gluyas needed to decide whether to take Pretty Punk home for the Adelaide Cup next month or remain in Tasmania for the Launceston Cup on Wednesday week. A homebred for Harry Perks that was raised at Mill Park as was last Friday's Bow Mistress winner Gogogo Grace, Pretty Punk has the overall record of six wins and six seconds from 24 starts with prizemoney topping $430,000. Now a two time stakes-winner, she is the best of three winners from Reliability, who has a yearling colt by Pretty Punk's sire Rebel Raider that will be offered by Mill Park at the 2018 Magic Millions Adelaide Yearling Sale as Lot 174. Pretty Punk was the third weekend stakes-winner raised/ sold by Mill Park joining Gogo Grace and also exciting prospect Booker, winner of the Group III MRC Kevin Hayes Stakes at Caulfield. Click here to read about them.